Are run of site links a good or bad search engine optimization technique ? Run of site links and linking is still around big time and there are still many convinced benefits outrank the damage such an approach may have w.r.t. organic placement and online visibility in the search engines. If you’re new to this, run of site links are placed in the page footer or sidebar and repeat themselves on each and every page of that website. If you have a link to your website placed on a footer you’ll have tens, hundreds of even thousands of backlinks pointing to you. Are run of site links good or bad ? The story I’m about to tell you is related to a website in the travel industry. I started following it last year with some preliminary work but nothing special really, search engine consulting work on the architecture, and a bit of on site optimization, and link building. There was a significant increase in traffic and all coming from search engines and organic placement. Work progressed and I was satisfied with the results obtained: there was more traffic which in turn was bringing business (for the first time ever). The following months traffic began to decrease, despite our continued efforts (both on-site and off-site). I didn’t jump to any conclusions at first and just continued working, there can be a number of reasons for a down turn in organic traffic that are not directly related to what is being done and it’s just not the case to get paranoid about traffic fluctuations. But after 3 months things were still flat and gray – traffic levels were dwarfed, reaming at significantly lower levels than experienced during the past months so … it was time to see what was happening. It didn’t take all that long. I discovered a run of site link pointing to us. The link wasn’t removed – the person who placed it said it was important and recommended they keep the link in place. I’ll make a long story short and come to the conclusion you are interested in: I did get them to remove the run of site link … but it took a number of months before it was actually removed … 6 months. Self explanatory isn’t it ? 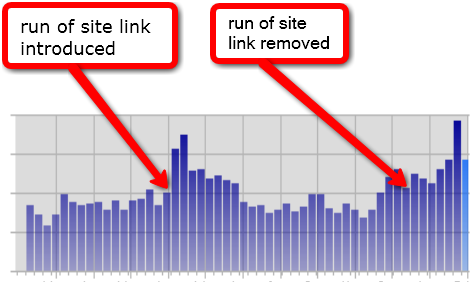 I used the weekly breakdown to give you a better view on the traffic levels and how there is a very tight pattern between the run of site link introduction and removal. During this time frame there were no other significant contributions to website visibility that would have contributed to search engine placement. Let’s take a closer look at what happened in this specific case. 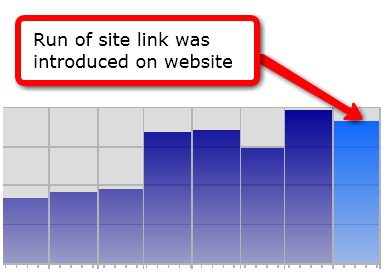 When the run of site link was introduced, there were very few incoming links. There was a sudden (and significant) increase of incoming links all from the same website – from about 150 to nearly 6,000 raising a flag and the webisite was penalized. The penalty disappeared along with the link and traffic is now going back to previous growth rates and levels. Run of site links. good idea or bad ? 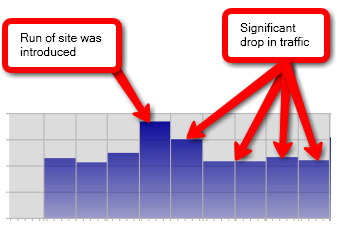 Run of Site Links – if indexed, do they "count" ? Run of Site Links – Delete or Keep ? I have no such idea. But got a good information. Could it be a good idea nofollowing all the links from the footer except the home page? In principle I am not a NOFOLLOW fan whe it come to the so-called Page Rank scuplting. Not all Search Engines behave the same way when it comes to NOFOLLOW. The point is that links that are NOFOLLOWED have no commercial value, so nobody is going to want such a link from your footer – so what’s the point of putting them there in the first place ? I believe the site links does no harm. The real harm comes from not enough links from different IPs. If you had alot of links from other sites, the sitewide link they offered you would have helped you in serps. to the footer’s links of a self-designed WordPress Theme? Well I’m no coder so let’s stick I’ll stick to the NOFOLLOW issue here. In principle if you are making your own template and wish to have a link on the template I wouldn’t NOFOLLOW it. I’m sure the search engines will interpret it as a vote of preference to you as the author of the template. will try to do this. Thanks for your information and for your comments. Do you have more? This is something that we at neutralize believed to be common knowledge and something that should not be practiced for a few a long time now. It is a very good article however. Makes you think. If that is truly the case then why have black hat linkers not just bought massive site wide links for there competitors. Its an unfortunate thing to see that done but thats the way some companies work. thank you for your comment and yes there is a lot of bad information on search engines out there many people take for good stuff. It’s interesting to read. I got useful information. There are seasons for traveling. You are talking about a travel site. solving the DC problem) he ist back in Traffic and going stronger every week. His graph looks very much like yours. Maybe it wasn’t the run of site link in your case and maybe it wasn’t the DC problem in my partners case but maybe it were only changes in googles algorithm? At the end a question: How old was your Domain? Is it possible you worked with a young domain? yes you are right about seasonal traffic in the travel industry and I am aware of this. In actual fact the dwarfing of the web traffic happened in June, when I was expecting things to take off and suddenly traffic began going down â€“ now that I read your observations I went back to the graphics and can see that there is no time scale to be seen but I can tell you that all this happened during summer months (so traffic went down during summer months when in actual fact it should naturally go up all other factors being equal). On to your 2nd question. I won’t elaborate here and now but suffice to say that those extra links were removed and the site went back to it’s good rankings. Domain age in this case is certainly not an issue. You can be as old as you like if you do something wrong you’ll get penalized. As to Duplicate content it will not generate a penalty. Keeping your site clean can only help achieve rankings, but no Search Engine will penalize you for not doing so, they simply will not reward you. Here’s my two cents from my personal experience. I ADDED a run-of-the-site link to three brand new sites I launched within a two month period in 2008. My backlink count went up by about 30x. None of the three sites have content that’s related to my site theme. Not only did my organic traffic increase, so did the PageRank for the target page. I posed this question to two different experts at the tech support team at WebCEO. Both indicated that, in their opinion, run-of-the-site links were beneficial and would not harm a site. I researched this topic before placing the site-wide links and my conclusion was that they would not be harmful for rankings. What you are saying doesn’t surprise me at al – in fact the proble arises when you suddenly add an abnormal amount of links to a site, where *abnormal* depends on the hsitory of your link building profile. But even then these are issues that can change very rapidly. I disagree with you, run of site links are not beneficial in any way these days and can only hurt you.